Our trust is called Sangye-Menla and was named by His Holiness the 17th Gyalwang Karmapa, Ogyen Trinley Dorje. Sangye means Buddha, Men means medicine and La is a form of respect. So, Sangye-Menla means Medicine Buddha in English. He is also know as the ''Healing Buddha'' or ''Doctor of the Body and Soul.'' He is blue in colour and holds a Medicine Jar in one hand. By reciting his name, or the mantra above, one can ward off disease and calamity, and bring about peace and joy to the sick and suffering. H.H. Karmapa decided to call the trust this name in the hope that through its work the great aspiration of Sangye-Menla would be translated into action. 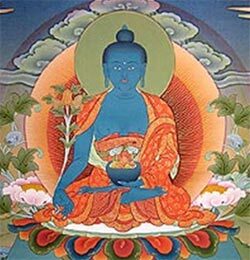 Medicine Buddha, King of all physicians.